Outriggers are a great thing, they allow you to troll more lines in the water than you can pull from the boat alone. More lines in the water = more fish in the boat. They are made to spread the baits out so they do not tangle as easily. First we need to pick the correct type of outrigger for our boat. On small boats there are three different types of mounts that can be used. The first is called wish bone, 2nd is a deck mount and 3rd is a side mount. The wish bone will support the longer, heavier outrigger, say in the 20 plus foot range, they are for the larger boats in this class, say 28 feet and up. The Deck Mount is the type that is the most common on smaller boats, say 20-28 feet long. The Side Mount is common on Walkarounds and small boats (16 to 20 feet) that really don't have a deck area to attach the outriggers. They can also be used as Top Mounts for 20-28 foot boats. The big decision is how long and heavy do you want the outriggers to be. If you want longer than 15 feet with aluminum the Wish Bone is probably the best bet. If you want 15 feet of aluminum or fiberglass the Deck Mount works well and if you want fiberglass or light aluminum then the Side Mount. Be careful with the Side Mounts when using heavy outriggers. They are prone to pulling out or causing cracking. I personally use 15 foot fiberglass outriggers with the deck mounts mounted in my hardtop. They are easy to use and the fiberglass outriggers do not weigh very much. We have picked out what type of outrigger we want. Now let's talk about where to mount them. The first one here is a wish bone mount and the second could be either a deck mount or a side mount. They both look about the same from this point. The third is top mount. It uses the same type set up as a deck mount. Con: Heaver, much more expensive to buy, hard to work with, more expensive to repair. Pros: Inexpensive to buy, Inexpensive to maintain, easy to work, Lines are close to water level. Cons: 2 lines max if that many, not as long usually 15 feet max, heavy aluminum tends to crack deck, take up rod space. Pros: More rod space than deck mounts, Great for skiff use, Inexpensive to buy, Inexpensive to maintain, easy to work. Cons: In the way on Walkarounds, Shortest of the four types, Get in the way of deck rails. Pros: Out of the way, Inexpensive to buy, Inexpensive to maintain, easy to work. Cons: Hard to reach from cockpit, line height is further from the water, Can crack unsupported hardtops, Short spread. All mounts should be thru bolted with stainless steel and backing plates. Think about what you are doing before you do it. Make sure you have easy access to them. Use the lightest poles possible for your size. Think about that popping sound the clips make when you get a real strike. I recommend that you buy good quality rigging. Lets take a look at the things you will need to rig the Outriggers. 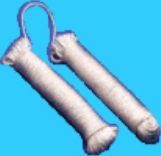 The first is a nylon cord for running in a circle around the outrigger. It goes through the eyes of the outrigger and out the top. Then you tie on an Outrigger Clip, then tie from the Outrigger clip through the Snubber (The second Picture) and back to the end of the line. Make sure that the line is kind of tight in both the raised and lowered positions. Let's talk about clips for a minute. Outrigger Clips come in many different sizes and shapes. The first clip pictured here is the high end of clips and is used more on the larger boats. The line goes from the rod tip, through the pulley ( It opens and closes) and out to the bait. 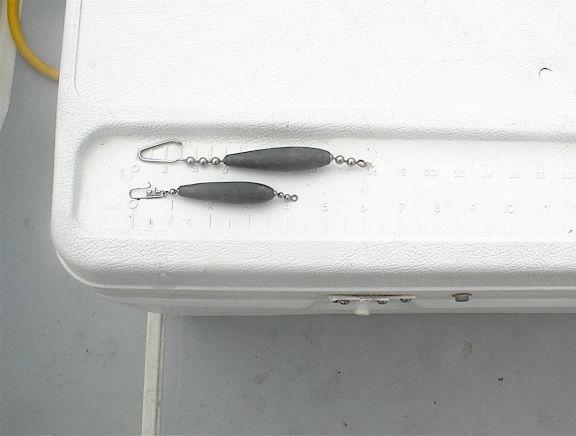 The tension is adjustable and so is the length on the baits. This means that you can drop back or pull the bait forward without releasing the clip. When not used on a daily basis this clip will tend to hang up a lot. The second clip pictured is called a Zip clip and the line goes from the rod tip behind the metal wire ( It opens and closes) to the baits. This is a very popular type clip that is adjustable for tension and bait length. If you don't fish everyday this is the clip for you. The third clip is a clothes pin clip and it has been around as long as Outriggers. It is adjustable in tension only and is probably better used for flat lines than as an Outrigger Clip. When using a clothes pin type clip don't forget to make a loop in the line and twist it a couple times and insert the end of the loop into the clip. We now have mounted, rigged outriggers and we are ready to fish. WOOHOO! It's a happy thing :) I always like to put out the outside lines first and work my way in. So lets start with the outside starboard (right) line which will be the line that is the furthest back. Ok, here is a picture of how the lines are staged. Start with the two outside lines and work your way in. 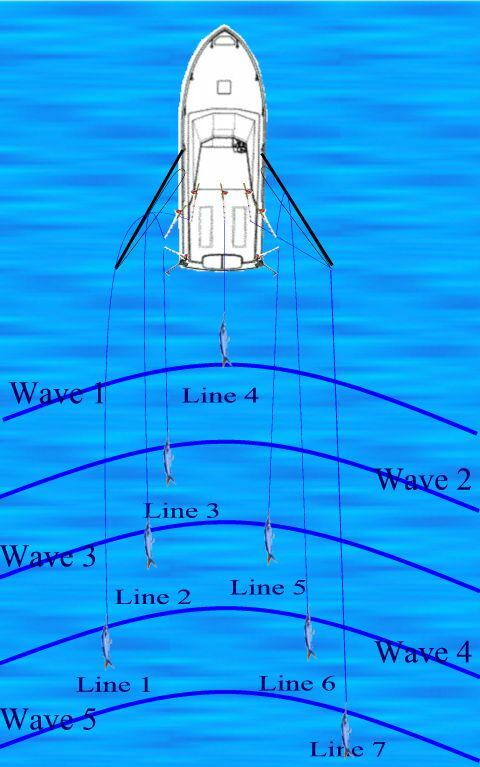 If you have a smaller size boat, forget lines 2 and 6. They are more of a pain than they are worth. The left side, lines 1,2 and 3. I like to put at depth. The idea here is put baits at all depths till you find out where the fish are biting then move the other baits ( with in reason) to that area. Line 1 is on a small torpedo weight. Line 2 is on a Larger torpedo weight. Line 3 is on a downrigger at the deepest area that I want to fish. The center bait which is line 4, Comes from the rocket launcher overhead to a flat line clip that is between the motors and straight back about 10-12 feet. I like it in the prop wash, on the surface, front and center. How close? Real close. Right in the major white water coming from the prop. Why? well catching fish on this one is kind of tough. Don't catch many on this one. Why use it? Cause having a 30 lb king SKYROCKET, look you in the eye while he spits the damn bait at you is very, VERY coooooool. I like it. That's why! Line 5, downrigger, higher and further back than Line 3. Line 6 small torpedo weight. Line 7, on the surface. Now before you start with the "My friend does it like this". I know. I know. There are more spread configurations in this world than there are fish. Everybody does it a little different. This one is easy. Start with the basics and move on from there after you get the hang of it.